Being as impressed as we were by the community, its values, sustainable initiatives and great architecture, it only makes sense to highlight a few more of our favorite finds in the City of Roses. Of course, we have to credit Build LLC for their guide, The Modern List, which led us to the Hotel Modera and several other great sites. 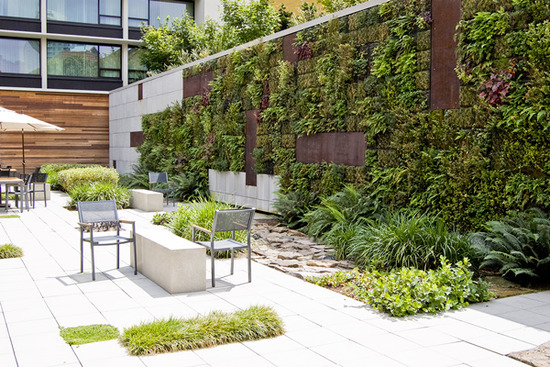 Only a couple blocks away from the famed Portland State Farmers Market, the hotel's courtyard is a prime example of a well-implemented green, or 'living', wall. 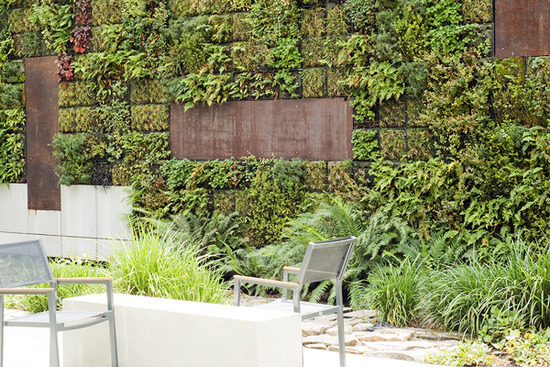 As much as we love vegetated roofs, we've been a bit less convinced when it comes to the aesthetic qualities of green wall systems. Often, they look great when installed, but without proper maintenance, they can tend to appear overgrown and unkempt... which might be acceptable if that's the desired look. However, these systems are often incorporated into contemporary designs, so they can become distracting or even overwhelm the architecture. Even worse, they could have issues that create the significantly less savory concept of a 'dead' wall, as seen below of the images of the Paradise Park Childrens Centre in the UK. For more on the unfortunate fate of London's first living wall, read the complete post at Jetson Green. Without knowing enough about the design, installation and maintenance issues at Hotel Modera's wall, there are still a few design features that keep the space from feeling more verdant, less jungle. Primarily, the extensive wall is based on a grid pattern, with vegetation juxtaposed alongside random panels of different materials, such as cor-ten steel. This approach breaks the continuity and creates a sense of geometry and order that could otherwise be lacking. It's also located well to create visual interest and creates an effect that draws visitors from the street to take a closer look. Another factor that keeps the overall courtyard design consistent is the extension of the grid concept at the horizontal floor surfaces, where pockets of greenery extend into the walking surface, making the vertical landscaping seem more integrated as a part of the overall courtyard design. Similarly, the intersection at the wall to the floor is softened by additional planting and rough, textured stones at the base, allowing for a visually smooth, natural-feeling transition, as the plants and stone give way to the concrete that covers the majority of the exterior space. All in all, though there are most certainly numerous beautiful, healthy and well-implemented green walls, this just happened to be one of the most lovely and creative we've seen in a while... Enjoy!